As you probably know already, I’m a huge fan of self massage because back in 2012 I had made this post on how to get rid of muscle knots. Well, I finally made a video that shows how to use the foam roller, my favorite self massage tool! And I know not everybody needs to watch a 6-minute video to understand how to use a foam roller, so I made looping GIF’s of it to help save you time at the bottom of this post as well. That’s just how much I love foam rollers. What is a foam roller? How does it work? A foam roller is a self massage tool. During a deep tissue massage, someone typically kneads their fingers/palms/elbows into you and it feels good… right? Well, instead of someone massaging you, you roll over this cylinder and the pressure of your own bodyweight helps to get the knots out and relax your muscles. So, that’s why I have one. It’s like getting free massages for the rest of your life. Underneath the armpit area and back of your shoulder is loaded with fascia and tendons of many muscles (lats, teres, triceps, post delt, etc)… so it’s easy for adhesions to build up in this claustrophobic space! Emmet Louis shows you how you could get into those nasty bits by putting the roller underneath your arm pit and roll to the side and back. When you feel really terrible tissue quality, just stay there and do some DEEP breathing to relax. Why avoid rolling the lower back? 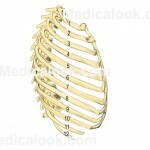 The thoracic spine (upper back) has ribs attached to it that come around and support your entire body. The lower back doesn’t, so when you roll your weight over this area, the vertebrae literally collapse toward your organs. So when you roll over the upper back, the ribs distribute the stress. Remember, the ribs wrap AROUND to the front of the body. So when you roll over your upper back, everything moves as one unit, does that make sense? When you roll over your lower back, it’s not so much the danger of the internal organs, but the danger of the actual vertebrae being pushed too far apart because it lacks the same support structures that the thoracic spine does. That is why we avoid rolling over that area. The 13″ original Triggerpoint Therapy one is the original one I used and love. But to help you make a better decision, I wrote an entire guide so you could figure out which foam roller you should buy! Want another amazing Self Massage Tool? If you do a lot of climbing, hanging or grip relaetd work: I also love to use the ArmAid (dubbed the ‘ArmGasm’) as it’s specifically for the forearms.